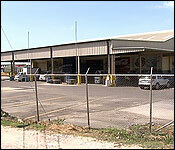 There was a big money robbery at Bowen & Bowen's Slaughterhouse Distribution Center last night. Armed thieves stole over twenty-five thousand dollars. At around 7:45, 4 masked men - two of them armed - went into the sales office, held up the employees and helped themselves to all the cash they had collected form the day's sales. The foursome then escaped in a boat which sped off toward the Belcan Bridge. Police are investigating, and it appears that they suspect that it may be an inside job. 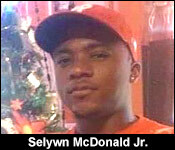 That's caused a lot of worry and concern for the Belize City family of 22 year-old Selywn McDonald Jr. He's a high school graduate who recently began working at the company. He reported for work for his usual evening shift yesterday, but never got home - because police took him into custody. Daphne Grant, Mother of Selwyn McDonald Jr.
"We are waiting for him about 8pm last night, because that is the time he usually comes from his shift and then he goes back and come home after 11pm and well he didn't come in, because he had slept at my mom house, so my brother came and woke me and tell me that they robbed Bowen and Bowen and how gunmen took my son. But it wasn't true, it was the police who took him and the people at Bowen doesn't want to say anything, nobody wanted to talk to me. When my daughter came, they told her that have my son for a pending investigation and robbery. But they can't have my son on pending investigation and robbery. They can have my son for questioning, because yes they robbed the place where he is working. But they are putting him like he is a criminal and they will lock him for 48 hours. If they need to question him, then question him and let him go. If they need him, he is right there. True or lie? I am on the right track right?" "I am saying the police are dealing with you as if you are foolish. I think somebody should tell you something. If it's your son, you jump up out of you bed, they bring a bad news like that - at least somebody could answer some questions for me. I am out here from morning and nobody [police] is answering my questions. So I say I need to call the media to speak about this, because I can't leave myself silent. I already lost a son, so when they come and tell me that gunmen went my son this morning, you imagine how I felt - to come to these people [police] and they treat you like that." "I'll ask you straight up: did you think your son had anything to do with that robbery?" "My son doesn't have anything to do with robbery. If my son works for $50 and that would satisfy him. My son tell me that the job is not paying too good, but that he will hang in there because he want to go back at the other Bowen and Bowen up the road. So it's a job where he wants to stay in. He just graduate from high school the other day. He wants a job. They don't have any jobs for graduate students anymore, so he settle for what he got. He is an honest person. He has not ended up with police as a thief or anything. He has never been in police hands. So they can't put my son like that. He is not a thief and I will put my head on the block all the time." We called Bowen & Bowen for comment, and this evening, Shelly Bowen Stonesifer, the Consumer Marketing Manager at Bowen & Bowen, responded to our requests. Via text message, she told us, quote, "four robbers made off with cash from the days sales which was scheduled for Armoured Truck collectionâ€¦we will be reviewing our security protocols company wide because of this incident. Thankfully, all B&B Staff were unharmed, and are being counseled from the trauma of the robbery." End quote. Police say that they were looking for one more person, and best information to 7News is that they detained another employee of the company. The last major robbery at the Slaughterhouse compound happened in June 2002. Former employees Leslie Pipersburgh and Patrick Robateau are serving life sentences at the Belize Central Prison for that robbery where 4 persons were murdered. Among the victims were security guards Kevin Alvarez and Fidel Mai, who were shot and killed inside the compound. 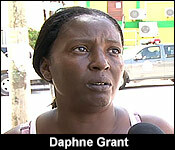 Civilians David Flowers and Cherry Tucker were killed while the robbers were trying to escape. 1 registered members (1 invisible), 236 guests, and 5 spiders.